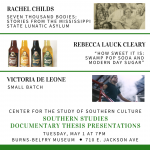 Southern Studies MA Students to Present Projects on May 1 On Tuesday, May 1 at 7pm, the Center will host Documentary Thesis Presentations for Southern Studies M.A. 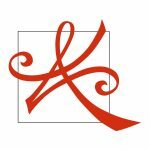 students Rachel Childs, Rebecca Lauck Cleary, and Victoria De Leone. 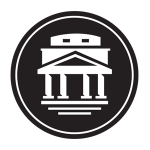 The event will be at the Burns-Belfry Museum and Multicultural Center, 710 Jackson Avenue East in Oxford. 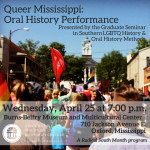 Students in Dr. Jessie Wilkerson’s Southern Studies 506 Graduate Seminar in Southern LGBTQ History and Oral History Methods will present an oral history performance Wednesday, April 25 at 7pm at Burns-Belfry Museum and Multicultural Center. 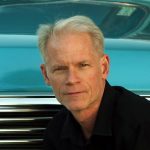 The event is free and open to the public, and a reception will follow the performance.